Astraweb informed us that they start a special offer for the existing customers as also for the first-time users. The special offers an unlimited DSL membership for about $7,50 per month. In other words, you pay $15 while signing up, but the duration of your account will be 60 days. You will be billed each 60 days for $15 and your membership will be extended. This offer is not limited to the amount of rebills, you can use it as long as your subscription is active. The offer is available only if you sign up for a membership through PayPal. This is not clear how long this offer will be available, so that I would hurry up! The special offer of Astraweb is surely the best offer you can get at the moment. 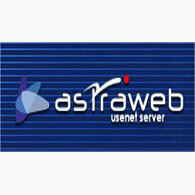 Astraweb is a popular Usenet access provider and is one of the leaders on the market. As member of this provider you can benefit from 2132 days retention, 99% completion, powerful infrastructure of servers located in United States and Europe, SSL encrypted data transfer and much more advantages. While ordering an unlimited DSL account you will get Usenet access without speed and download limits. The amount of simultaneous connections is limited to 20, but the download speed is set to maximum of your bandwidth. Astraweb is over 15 years on the market, so this is a provider you can trust. As we’ve wrote in our Astraweb review - the provider is one of the best on the market.